Tasty, unique and FRESH! 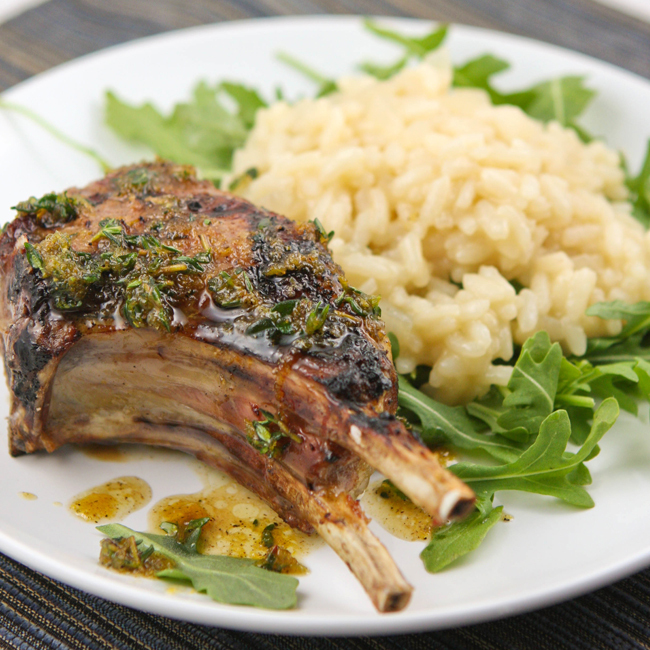 Try this Grilled Lamb Chops and Meyer Lemon Risotto with Arugula. Let all the flavors of lemon, honey and cumin simmer together on the meat. The chewiness of the full-bodied, flavorful Risotto will be fulfilling. You won't be disappointed you have leftovers! 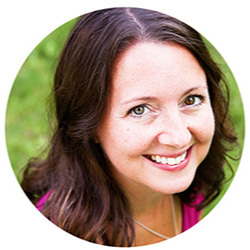 A while back, McCormick contacted me and asked me if I would like to create (and blog about) a recipe based on one of their 2012 Global Flavor Forecast flavor pairings. My answer was, Heck yes! From their list of unique flavor pairings, I chose Meyer Lemon with Lemon Thyme, Limoncello and Lemon Peel. 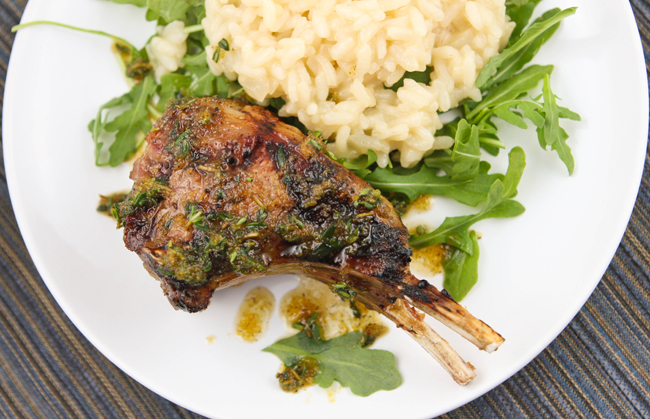 I received a kit in the mail, along with this Grilled Lamb Chops with Meyer Lemon Risotto and Arugula recipe. Dan and I both loved everything about it! It was tasty, unique and fresh, and I am very excited about the leftovers that I get to eat later today. Tasty, unique and FRESH! You won't be disappointed you have leftovers! For the Risotto, melt butter in large saucepan on medium heat. Add onion; cook and stir 2 minutes or until softened. Add rice mix; cook and stir 1 minute to toast rice. Add lemon juice and Limoncello liqueur; cook and stir 1 minute or until almost evaporated. Stirring constantly, add warm stock, ½ cup at a time, until liquid is absorbed by rice after each addition. (It takes about 25 minutes for all of the stock to be absorbed and the risotto to become thick and creamy.) Season with pepper. 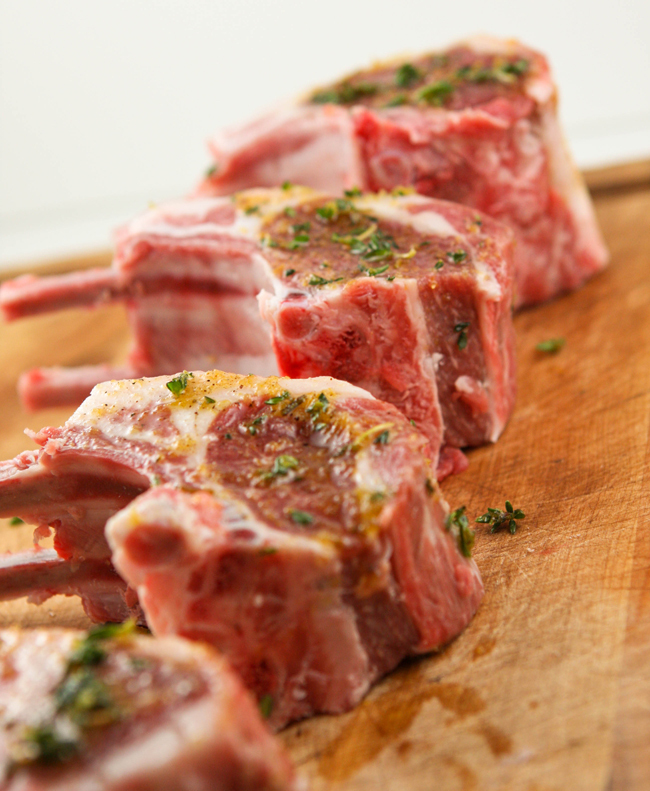 Grill the lamb chops over medium heat for 10 to 15 minutes per side, or until they have reached desired doneness. Let stand for 10 minutes. Divide 2 cups of arugula among 4 plates and top with the risotto. Place a lamb chop on each plate and drizzle with the remaining seasoning mixture. Mix lemon thyme, oil, honey, lemon peel, ginger, pepper and sea salt in small bowl until well blended. Rub 1 tablespoon of the seasoning mixture on lamb chops. Grill lamb over medium heat 10 to 15 minutes per side or until desired doneness. Let stand 10 minutes. Divide arugula among each plate. Top with risotto. Place a lamb chop on each plate. Drizzle with remaining seasoning mixture. And since Limoncello is not something I never think to buy, or drink, I had to pour myself a teeny tiny glass to enjoy along with my meal!